Strange just how much can happen in one-third of a year. Four months ago to the day, I was wheeled into an operating theater in Denmark's top hospital. 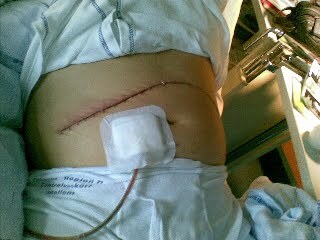 In the intense few hours that followed, a gifted surgeon and a deeply professional team obtained a dream result: they successfully resected a malignant tumor from my pancreas and then took an incredible number of biopsies from surrounding tissue, just to be on the safe side. Each and every one subsequently came up negative, so the cancer hadn't spread. I wrote briefly about the experience of being both diagnosed with the deadliest of all the cancers and spared/saved from it all within the space of three weeks. Many people have asked me: how have things been going since? The answer is not simple, for one reason: chemotherapy. As part of its world-beating approach to combating deadly cancers, Denmark's University Hospital recommends and requires that a "cured" patient nonetheless undergo follow-up chemotherapy...for six months. Three of those months - nearly - have now elapsed, though I have to admit that no month when you are undergoing chemo "elapses" (if only). Having one's post-operative existence divided up into 21-day cycles, each one marked by rising levels of heavy metals in one's body, well it's no walk in the park, alas. And the side-effects of the chemicals used [PDF] - I can testify - are in some ways as insidious as the original cancer, in that they are gradual, but comprehensive. In my case, and remember each and every cancer patient reacts difficulty, I managed the first three cycles, 63 days, with only a few setbacks. But the fourth cycle somehow knocked me sideways, which is why you have heard so very little from @jg21 on Twitter, and seen so very little of me on Facebook since June's wonderful 8th Cloud Expo in NYC. The past three weeks, in fact, have brought me face-to-face with some very harsh realities. The final three months of chemo are going to be a challenge...and, in order to successfully meet that challenge, I am going to have to dramatically rearrange my professional priorities so as to maximize healing time, minimize stress, and optimize my working day. For all indirectly affected by this epiphany, which would probably have been better had it come a tad sooner, I apologize. But never has "less is more" been truer. For me to be back to fighting fitness - and weight! - for the Fall, I need finally to accept that convalescence (from Latin convalescere, whose root is in valescere, to be strong...which I currently am not) isn't something that you just "fit in" around all your other commitments; it is something you have to prioritize ahead of those commitments. My aim in July, August and September then is to write, but to do so largely offline. You will still see the results online, but only as and when they are uploaded. Look out soon, for example, for my updated and hugely expanded Top 350 Players in the Cloud Computing Ecosystem, for an entirely new feature, Around the Cloud in Eighty URLs, and assorted other features aimed at providing convenient one-stop destinations for Cloud insights and information. I need a 3-month respite from Twitter. By the final three months of 2012 I shall be completely done with chemotherapy, will no longer be tasting heavy metal at the back of my throat 24x7, will no longer be falling asleep for 12 hours at a time, and will no longer see every muscle group in my entire body subject to the ravages that only chemo can exact...a fierceness that has no respect for former waist or neck sizes. I repeat to myself twenty times a day that it is better than the alternative. And it is. But it would be wrong of me to pretend that this hasn't been the longest four months of my life, and that I am steeling myself for a rough final three months still ahead. When all is said and done, it seems a ridiculously small price to pay for surviving pancreatic cancer. I am very, very grateful. Gratitude unlocks the fullness of life. It turns what we have into enough, and more. It turns denial into acceptance, chaos into order, confusion into clarity.... It turns problems into gifts, failures into success, [and] the unexpected into perfect timing."